Eating healthy can include eating pizza, as long as you opt for a pizza that is not oozing with fat and high-calorie toppings and don't eat an entire 18-inch pie in one sitting. A number of frozen pizzas on the market are healthy, tasty, convenient and available at most stores. While taste is subjective, nutritional information is not. The healthiest frozen pizzas all share the same traits of being low in saturated fat, high in fiber and medium in calories. 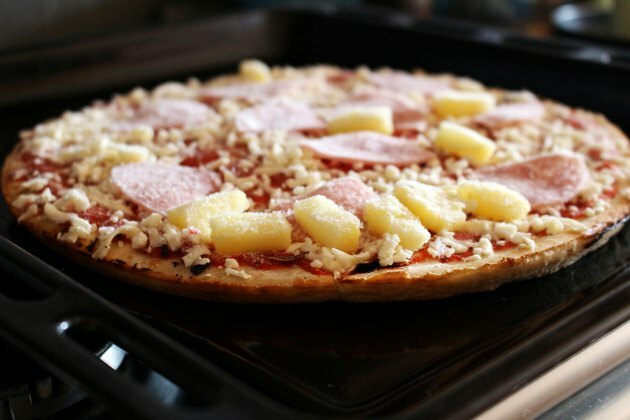 Frozen pizzas by their very components of cheese, crust and toppings are generally not going to have fewer than 250 calories per serving – and serving sizes are often a single piece. Several frozen food brands specialize in low-calorie, low-fat and healthy choices and two of them made the best pizza list from “Fitness” magazine. Lean Cuisine, a subdivision of Stouffer’s, ranked in the top four for its Deep Dish Margherita Pizza. A single serving consists of the entire mini-pie and contains 320 calories, 4 g of fiber, 2.5 g of saturated fat and 9 g of total fat. The South Beach Diet brand also made the list with its Harvest Wheat Crust Pepperoni Pizza. The single-serving pie has 350 calories, 9 g of fiber, 4.5 g of saturated fat and 12 g of total fat. Just because a frozen food brand doesn’t say “lean,” “diet” or otherwise tout its healthiness in its name doesn’t mean it’s not healthy. “Fitness” magazine ranked two such pizzas as healthy and tasty: Amy’s and DiGiorno. The pizzas are available in full-size pies, with a single serving counted as a single slice of pizza. The specific Amy’s variety that made the list is the Whole Wheat Crust Pizza Cheese and Pesto, with each slice containing 360 calories, 2 g of fiber, 4 g of saturated fat and 18 g of total fat. The Harvest Wheat Thin Crispy Crust Supreme Pizza is the variety from DiGiorno, with each slice containing 250 calories, 4 g of fiber, 3.5 g of saturated fat and 8g of fat. “Women’s Health” and “Good Housekeeping” also chime in on their choices of frozen pizza, although they focus more on taste over nutrition. Although “Good Housekeeping” also noted DiGiorno and Amy’s are tasty, they placed diet brands such as Weight Watchers, Healthy Choice and South Beach Living at the bottom for being bland and mushy. “Women’s Health” lauded Cedarlane Zone Pizza as a healthy substitute to fill a junk food craving.